Choose your work site. Make sure that you can easily access your kitchen and garden but it it not in clear sight. You need a container to place your grass clippings and compost leaves in. You can make one yourself using a 4ft wide 8ft long piece of wire mesh. If you live in a place that gets a substantial amount of precipitation cover your bin with a sheet of plywood. A 3 bin compost storage system allows you to move compost easily and store finished compost until it’s ready for use. Remember to leave one side of your compost bin open so you can add new compost easily. Green garden material and brown garden material make up compost. The green elements are rich in Nitrogen and the brown elements are rich in Carbon. Adding too many green materials can make the compost pile smell. Be careful not to add animal waste, meats, oils, pesticides ot herbicides to your compost piles. 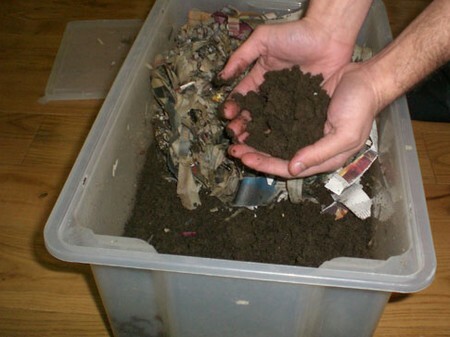 As a rule of thumb compost piles with 2 parts brown material to one part green material break down the best. Do this by placing on forkful of green material in a pile, top the pile with two garden forkfuls of brown materials. Mix the pile together thoroughly. Continue adding green material until the compost pile is 3 cubic feet. Place a some garden soil, or finished compost in your new pile to give a boost to the microbial activity. You want to make sure your compost pile has the right amount on moisture. It should have the feel of a damp sponge. Too much liquid can cause temperatures to decrease and make the compost pile smell. Not enough moisture can make the rate of break down slow and the pile make not heat up. You should monitor the moisture in your pile weekly. Adjust it if necessary. You can add more brown material if there is too much moisture. Turn the materials of your pile weekly. This assures that the pile is not compacted and reduces the airflow. The pile should finish in two months. You shouldn’t be able to identify any materials in the pile. The color is dark brown and the smell is earthy. You can make another compost system y piling leaves and grass into a secluded corner of your yard. The compost will mature in about 6-12 months. The materials at the bottom and middle of the compost pile mature the fastest and are ready for use first.